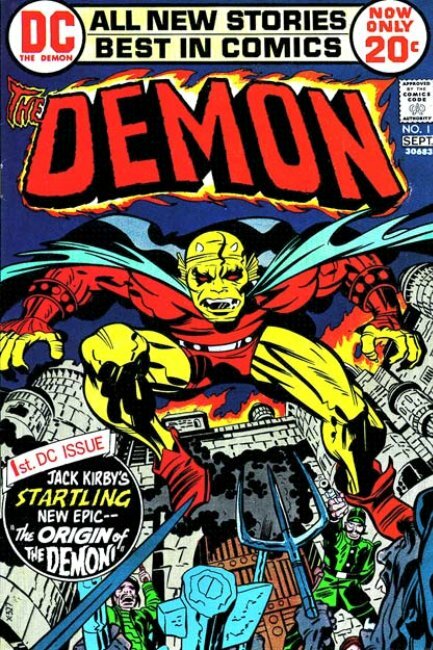 Kleefeld on Comics: On Business: The Demon Reprints? 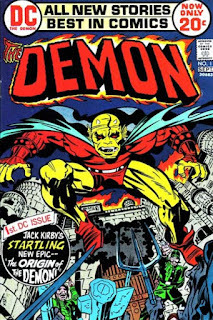 In the 1970s, Jack Kirby launched a number of titles for DC. They were generally dismissed by the industry at the time, with some of the Jack's artwork being redrawn for long-standing characters, and newer works getting cancelled despite decent sales. It was only a decade or two later that people started to understand what Jack was doing at the time, and appreciate it beyond his devoted followers. And it's really only been within the past ten years or so that DC seemed to start acknowledging the creative output Jack did for them by reprinting his stories. But, to me, one of the stranger cases from a business perspective is Jack's The Demon. Jack's original run on the 1972 title, featuring a character of his own creation, lasted only sixteen issues. DC Special Blue Ribbon Digest #5 reprinted the first issue in 1980, but aside from that, nothing else has been collected or reprinted by DC except in one Omnibus collection that came out in 2008. No trade paperbacks, no Archive collections, no other single issue reprints, none of the books are even available digitally! IDW did come out with an "Artist's Edition" version which just uses Jack's original pencils but, here again, only the first issue. Which means your options, if you want to read that story are either track down the Omnibus or all 16 of those back issues. Now, granted, this is basically how comic collectors used to have to operate all the time! Reprints weren't widely available, digital wasn't even an option, so you had to do a lot of scouring to get the original books. And that was even before the internet made quick searches on ebay easy. I spent my early decades as a comic fan working like this. But here, now, in the twenty-first century, that seems a very strange business decision. It's not like The Demon is this obscure work or he's an unused character. Or like Jack himself is unheard of. You can get Forever People and Mister Miracle --both works created by the same man for the same company in the same time period--in paperback and digital formats currently pretty easily. Kamandi is only hardcover and digital, but not prohibitively expensive. But The Demon? While it's got a MSRP of $50, in the past two or three years, I haven't seen a copy for less than $100. Most have been $125-$150. The original individual issues usually run about $10 each, whether you get them independently or as a set. All of which says to me that there's still a pretty solid market for this material that DC is ignoring. Now it'd be one thing if they still had to go back and digitize everything, touch it all up, and recolor it... but they already did all that for the Omnibus. Why not use that same work to set up a relatively inexpensive two or three trade paperback set? Or shoot the files over to comiXology to at least make them available digitally? Clearly, I'm missing something here, some unique business justification why they aren't putting this out there. What is it? Sean: not to muddy the waters, but as a fan of both Kirby and reading comics digitally, I feel I should point out things aren't as cut & dry as you make it. I feel this points to the fact the business justification may not be as unique to Kirby's Demon as you suggest: chances are quite good Kirby's reprints sell poorly in the digital market. To the extent DC continues to make previously unavailable Kirby issues available in the digital format, I suspect that has as much to do with internal activism within the company as business practices. My impression is that Kirby doesn't sell. The bulk of DC fanboys largely remain lame Batman-centric types and decades of anti-Kirby propaganda and editorial messing with his concepts from the higher ups has had an effect. So many things working against an appreciation of these great comics from the Wednesday crowd. On the other hand, many creators are fans and there is growth in the wider culture towards an appreciation or at least name-recognition for Jack. DC has moved in recent years to boost the Kirby brand and the omnibus and other collections are a sign of that. Definitely, catalogs from book distributors have big Kirby sections. I agree that the series should be in print, but it is probably an economic decision above all else. I kind of understand the lack of digital comics, but I don't completely buy into the broader idea that Kirby doesn't sell. Granted, he doesn't appeal to the same audience who are buying the latest Marvel and DC stuff every week, but IDW has six Artist's Edition books that are exclusively Kirby artwork. Compared to John Romita's four and Walt Simonson's five. They wouldn't keep putting these out (another Kirby book was just announced a week or two back) if they didn't sell. Why has The Demon never gotten an archive treatment? Like Kamandi or Challengers. Why no trade paperbacks like Jimmy Olsen, New Gods, or Green Arrow? Why no stand-alone hardcover treatment like In the Days of the Mob, or Spirit World? Spirit World for Pete's sake! There's a new "ombinus" edition of Kamandi coming out this summer, in the same format as the recent DC silver age omnibuses (800+ pages, oversized, glossy paper). Some of the silver age omnibuses have been released as standard-sized TPBs a year or so later. So there's a possibility that a new Demon omnibus in the same format will come eventually, followed by TPBs. and here is the announcement of the complete Demon 30o pg softcover due in October. Good work, Sean!